What do you do if you fail the eyesight test for the US Air Force, then fail the eyesight test for the US Navy? You go straight over their heads and join NASA directly. 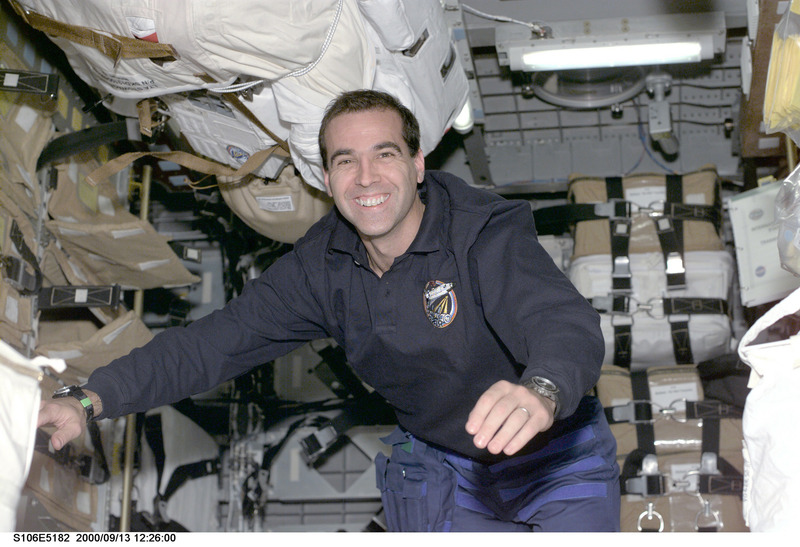 That’s what Rick Mastracchio did to get the coolest job off the planet, spending 227 days in space, flying on the Space Shuttle, Soyuz, International Space Station and complete 9 spacewalks. 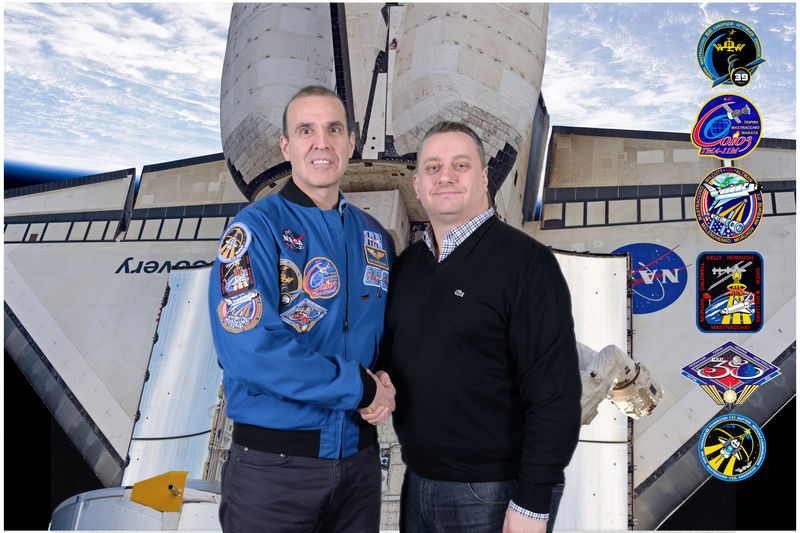 Today I meet astronaut Rick Mastracchio. Organised by the superb team over at Space Lectures, former NASA astronaut Rick Mastracchio and Space Lectures connected over social media and now he’s here to give a talk and a feature packed presentation which I’ve managed to capture below. Its’ a long read but worth it – Rick Mastracchio is a very friendly, likeable character and gave a very enthusiastic talk! I often get asked, how did you become an astronaut? The truth is every astronaut has a different path. A lot of people think they are all military pilots, but I wasn’t. When I got out of college I tried to become a military pilot, I took the exams and the tests but I didn’t have perfect vision so I couldn’t be a pilot. I did that with the US Air Force and then US Navy, I got turned down by all of them so went over their heads and joined NASA. Now when I see an Air Force guy I say they fly too low and too slow! The truth is I grew up in the north-east part of the US and NASA is on the opposite side of the country. NASA was this mysterious place for me and after I graduated from college with an engineering degree, my wife and I had a house with two small children, my wife saw an advertisement in a magazine. Nowadays they do it on the internet but back in the 1980s, I had never seen an advert for NASA astronauts, I thought that was great and wanted to see what an astronaut application looked like, thought it would be really cool. It’s just some government form, I threw it in the drawer and forgot about it. Shortly after that, the Challenger accident happened. I was an engineer up in Connecticut, the Challenger accident happened, I pulled that application out and sent it in. The reason is because I knew that NASA would come back strong and recover from that accident, they would need people and they would need help, so figured I would send my application in and see. A few months later a I got a phone call, they said they wanted me to come down and work for them as an engineer, not as an astronaut. I moved my family down to Houston. Houston is a great place but it’s not the prettiest place. We moved down to Houston in August, the temperature is near a hundred degrees and humidity is near 100% and we’re driving down the highway near Houston and my wife looks at me and says “you owe me big time for this one.” I’m still yet to pay her back 25 years later. So I’m down in Houston working as an engineer at Johnson Space Centre, applying over 9 years of applications, got interviewed 3 times and eventually got selected. Twenty years as an astronaut, selected in the 16th class of astronauts in 1986 and spent about 21 years as an astronaut, I left NASA in June 2017 and now work for Orbital ATK where I actually build the cargo ships that go up to the ISS. Here we are in Low Earth Orbit (LEO), there’s a lot of talk about going back to the moon, going to Mars. Right now we are in LEO, this is basically where almost every mission have gone, all the Mercury and Gemini, some of the Apollo missions, all the Space Shuttle missions are in LEO, all the Soyuz mission, all the Chinese, Russians, everybody, the ISS are LEO, over 300 crews. Only 9 crews have gone beyond LEO to the moon. LEO is 250 miles, it seems like we are very far away but only 250 miles up, circling around the Earth at about 5 miles per second. These 9 crews went 240,000 miles, that’s a thousand times further. Now we’re talking about going to Mars, the distances grow exponentially. When people talk about going to the moon or mars and how difficult it is, it s just a question of distance but also a question of other challenges like radiation, keeping human crew members healthy and alive. 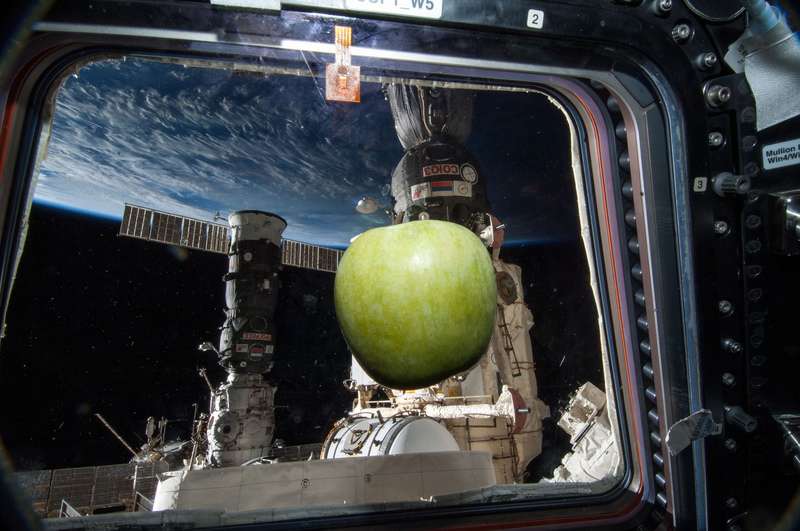 NASA is trying to get beyond LEO and leave that to commercialisation. I got to launch on 3 Space Shuttle missions, my first one was Atlantis on STS-106, STS-118 and then STS-131. The Space Shuttle is an incredible vehicle, the thrust to weight ratio is incredible. When those solid rocket boosters (SRB) light, you jump off the launchpad, like a kick in the pants, an incredible ride. (Video plays of STS-118 lift off) On STS-118, you may have heard of Scott Kelly, I’m sat in the middle as the flight engineer, the Commander is in the left seat, the pilot is in the right seat and then me in the middle as the engineer, or Mission Specialist 1, that was my area of expertise since I’d worked at Mission Control on guidance and navigation. My job was to watch the whole cockpit. The Commander watches the left side of the cockpit, the pilot the right side and the flight engineer watches both sides. You had to have two sets of eyes. Once the two SRBs fall off, you’re at second stage, it then gets very smooth. You go from pulling 3 Gs to )Gs in 0.5 seconds, its like getting thrown out of your seat. Then everything floats up in to your face. Some of the astronauts get up out of their seats to photograph and video the external tank. They do that because the damage from Columbia accident was foam falling from the external tank, so want to get good documentation and send all those photos and videos back to the ground. Ascent is a very quick 8.5 minutes into orbit. I was lucky enough to fly on 3 Space Shuttles, STS-106 was Atlantis, STS-118 was Endeavour and STS 131 was Discovery. The Space Shuttle is incredible, I used to get up early morning when I was young and watch the first Space Shuttle launches, it history in the making and I had to see this, little did I know that someday I would be riding on this thing. The most capable spacecraft ever built by anybody. It’ll be a century before we see another spacecraft built like this because everybody is going back to capsules because they’re a little but easier to build. The first reusable spacecraft, 135 missions, the first reusable engines, Space Shuttle engines will be used on the Space Launch System (SLS) that’s going to lift crew members back to the moon in the next few years, using used Space Shuttle main engines. Of course they’ll then splash down in the ocean and we’ll lose them for good. When you come in on a capsule, where you want to land has to be almost directly in front of you, very little cross range capability. The Space Shuttle had almost a 1000 miles of cross range capability, when you renter the atmosphere, you could turn the vehicle and land at a runway many miles away which extends your landing capability. First vehicle to have a robotic arm, first vehicle to have an airlock and pretty sure the first vehicle to have a toilet, which as an astronaut is kind of an important thing to have. 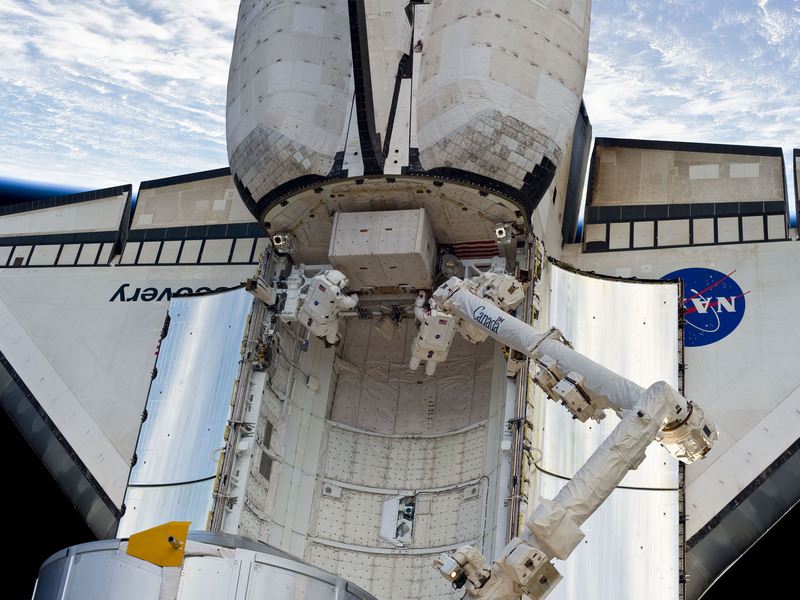 Ever since the Columbia accident, the Space Shuttle would approach the ISS using an RPM manoeuvre where the Space Shuttle would do a 360 degree pitch in order to expose its belly so astronauts of the ISS can do a photo survey of the tiles on the Space Shuttle. Those picture again are downloaded to the ground to see of there is any damage from the foam. On my second mission, STS-118, they actually did have damage, a big hole in our Space Shuttle. Once we got up there, we would then inspect it with the robotic arm, a detailed inspection using lasers the measure the depth and size of the hole and then send that data down to the ground and they would 3D print models of the damaged foam, put it in the chamber to test it. So while we are up in orbit doing our mission, engineers down on the ground were testing this damaged tile trying to see if we needed a special spacewalk to repair it. I was the lead space walker, prepared to go out and repair so we could all get home safely but it wasn’t needed. They ran enough tests that they were comfortable we could re-enter without any damage. After the Columbia accident, Shuttle damage became a very big issue. STS-135 in 2011 was the last mission. We still have the ISS, the Space Shuttle was used to build the ISS. The Space Shuttle is like a pick up truck, can take up large pieces of cargo, the crew cab is very small. We’d bring up huge pieces of truss segments, large modules, the robotic arm would grab these modules, take them out of the payload bay and then guys like me would suit up and go outside and bolt together the space station, connect electrical lines etc. I was lucky enough to do that nine times. 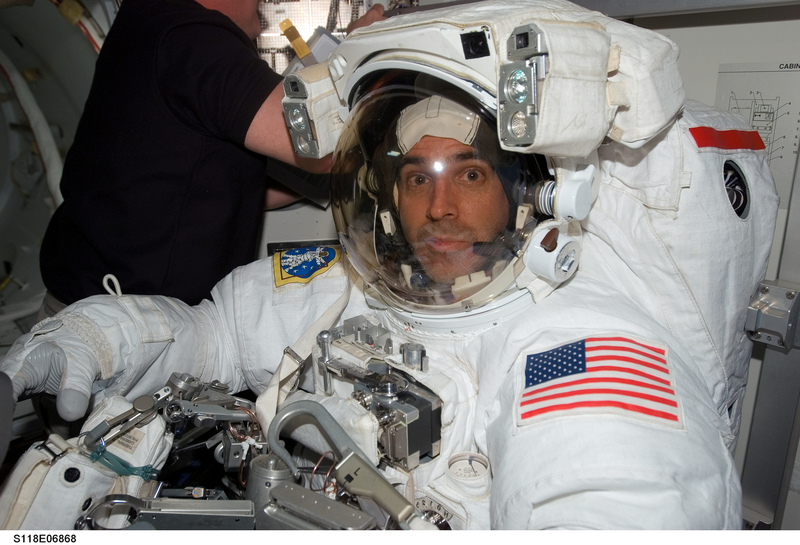 On STS-118 I did three spacewalks to bolt together parts of the space station, on STS-131 I did 3 others and then when I was up there for my expedition I did 4 more repairs. The ISS is a fully operational orbiting laboratory, it circles the Earth 16 times a day travelling at 5 miles a second. Its been crewed continually since 2000. We had about 200 experiments going on and I like to categorise them in 3 different ways. The astronauts are the experiment, we’re re taking blood samples, ultrasounds of our eyeballs, trained to do all these things and do science experiments. The second kind is where we are the operators of the experiments. There was an experiment called BASS – Burning and Suppression of Solids (in Space) where I was in a glove box lighting things on fire on board the ISS. We would change the nitrogen/Oxygen content, burn different samples, video tape it and take pictures and the principal investigator, I would have them on the comms system talking to me directly I was their operator for their experiment. The people coming up with these theories and science experiments for working on these for decades, it was great because of their enthusiasm, and also a lot of pressure because you wanted to do this experiment right and didn’t want to disappoint them. The third kind is where we really had nothing to do with the experiment. We are the maintenance people of the ISS, maintaining the computers, make sure everything has power etc. These experiments are allowed to run automatically, the alpha magnetic spectrometer which is outside the ISS etc, lots of different experiments going on. Not all of them involved the astronauts. There’s a lot of students running experiments too. We don’t have a Space Shuttle anymore, so how do we get there now? 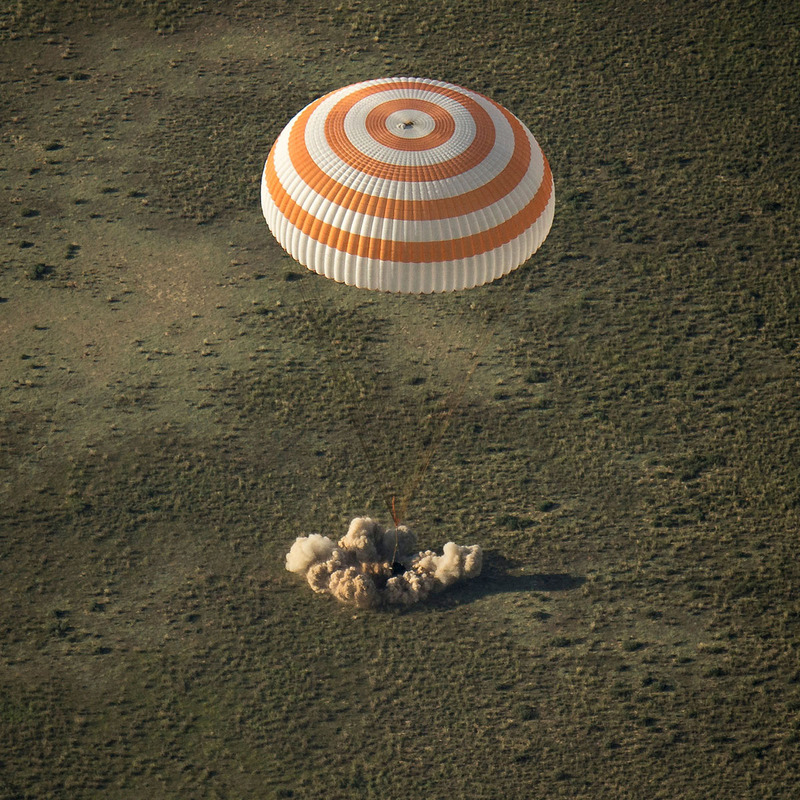 We fly to Kazakhstan and hitch a ride with the Russians on a Soyuz. The Soyuz rocket has been around since the 60s, the capsule itself was originally designed to go to the moon during the moon race. The Russians are smart folk, they take a capsule, a rocket and adapt to what they want it to do. I felt very comfortable flying on Russian hardware, very well trained. I spent 2 1/2 years training for this mission, spent 52 weeks in Russia and had to learn Russian. If you think it’s hard to do rocket science, try doing it while speaking Russian. So what’s it like on the inside? It’s a little bit more cramped than the Space Shuttle. Here we are in the capsule, we have a highly complicated G indicator (fluffy toy on string that floats when on zero G). If it point straight down then you are under acceleration or some kind of G forces, once its floating we know we are weightless. A very sophisticated instrument. 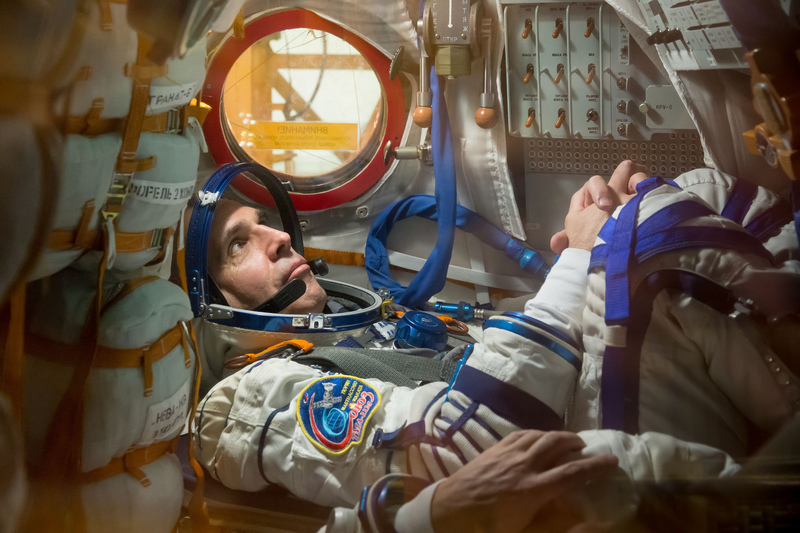 It’s a very cramped vehicle, the good news is that we were very lucky in that we were the second or third crew where the Soyuz launches, it usually takes about 2 days because of the trajectory, but they came up with a way to get us there in 6 hours. So when you are cramped up like that, 6 hours is way better than 2 days. We got there from lift off to docking in 6 hours. When I was up there after about 4 months, we were waiting for the next crew to come up and they had planned on a 6 hour arrival time but something happened to one of the engines and had tot change it to 2 days. Psychologically that’s got to do something to you when you were planning to be there in 6 hours. The Soyuz capsule approaches the ISS, similar to the Space Shuttle but without the RPM manoeuvre. You come in pretty hard in comparison to a Space Shuttle docking. 6 hour after launch, we are docked and attached to the ISS. It’s funny because you get there in 6 hours and then I’m going to be there 6 months. better just take 1 day at a time. Great to have the experience on both vehicles. We’ve got this incredible ISS up there but what are we doing up there? We’re doing science. All kinds of science, 200 different experiments. Experiments with sphere satellites, programmed by folks on the ground which are controlled by little CO2 canisters, and these satellites are used in many different ways. We have PhD from MIT programming control laws for satellites, then we also use them for students. We also look at other experiments like bacteria. For some reason, bacteria in orbit is much stronger. We’re trying to work on antibiotics for an E coli bacteria so you would have tunes with bacteria on one side and the antibiotic on the other so you would mix these up and then place in an incubator and then fixate that experiment. We would then take those samples and then send them to the ground so the scientist could then figure what was the most effective. How do we live up there? We’re up there for 188 days and we work Monday to Friday, Saturday is always cleaning, wipe the cheese broccoli off the ceiling, clean the filters etc and Sunday was our day off. What do you do? You can’t go home so you have to find things to do. Your sleeping back attaches to the wall so you don’t float away in a little personal space about the size of a telephone booth. I had to stretch my sleep bag out at an angle so I don’t have my head up against the ceiling. You can make personal calls to the ground, you’ve got a computer up there, you can tweet! It’s quite comfortable. In Space Shuttle mission you get zero privacy, the seven crew members, you all stretch out on the mid deck. Exercise is very important up there. We have to exercise about 2 hours a day. We run on a treadmill but you have to use a bungee cord to pull you down to the treadmill. You would run for about 4/5 miles a day and then do resistive exercises lifting weights for an hour a day. You get in really great shape but you are doing that just so you can walk when you get home. Imagine if you laid in bed for 6 months your muscles and bones would deteriorate to the point where you couldn’t walk so you have to exercise. This was a big problem in the early days of Space Stations. Now what we are trying to do is make that even more efficient where we don’t have to spend 2 hours, try and get it down to every other day etc. There’s a great selection of food up there, a lot of it is MREs, Meals Ready to Eat. Packaged foods with meats and pastas, a lot of freeze-dried food. Fresh food was really hard to come by. When a cargo ship would arrive, the Russians were great about bring up crates of oranges, grapefruits and apples etc. The vehicles on the other hand from the US were not so great at bringing fresh fruit. On one mission we got three rotten oranges and an apple, but the Russians had been doing that for a long time so they knew how to prepare the food and got the timing perfect while the Americans were still trying to work things out. I think sometimes that we had higher priorities than giving our fruit etc like setting up hardware. It’s the greatest place if you want to lose weight though, I had to eat 4/5 meals a day and I was still losing weight. That’s one of the concerns when you are up there so I would supplement that with protein bars which was a really bad habit when I got home. I was very lucky in that I got to do nine spacewalks. 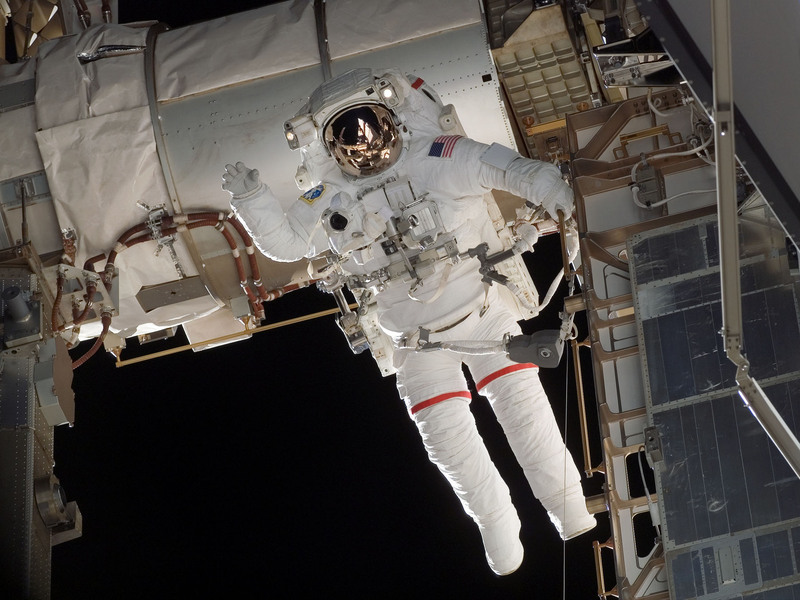 Spacewalks are done for many reasons, most of them in the early days of the Shuttle were going out there to build, to bolt something together. 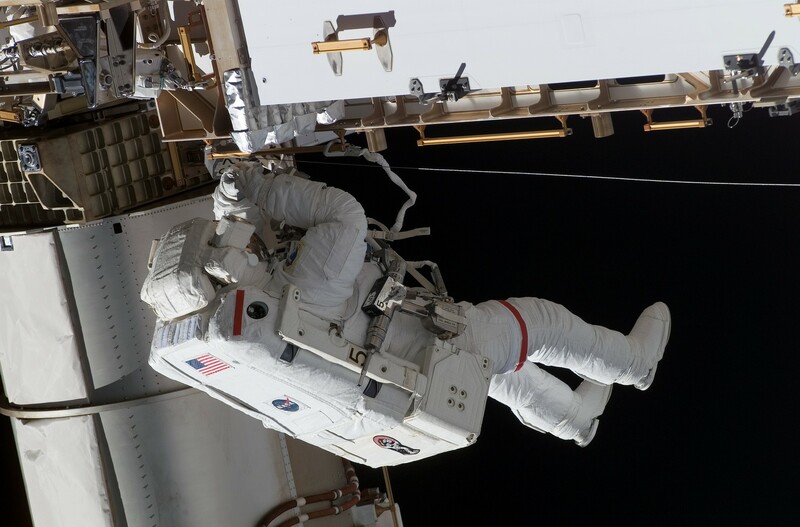 Now that the ISS is fully operational, most of the spacewalks are maintenance. The ISS is huge place that requires a lot of maintenance, changing out hardware that is getting too old, lubricating something, but the most difficult part, the most challenging is preparing for it. It takes days, you have to physically build your suit, check out every tool, tons of procedures, serial numbers to check, check every piece of equipment. They would tell you to use specific wrenches that matches the correct serial number, they are tracking everything, how many time wrench serial No 1 has been used etc. The suits are very configurable, can be sized to anybody, they have different arm and leg inserts etc. Once you get outside, that’s where the fun starts. You don’t do any walking, it’s all hand over hand, there’s handrails all along the ISS. 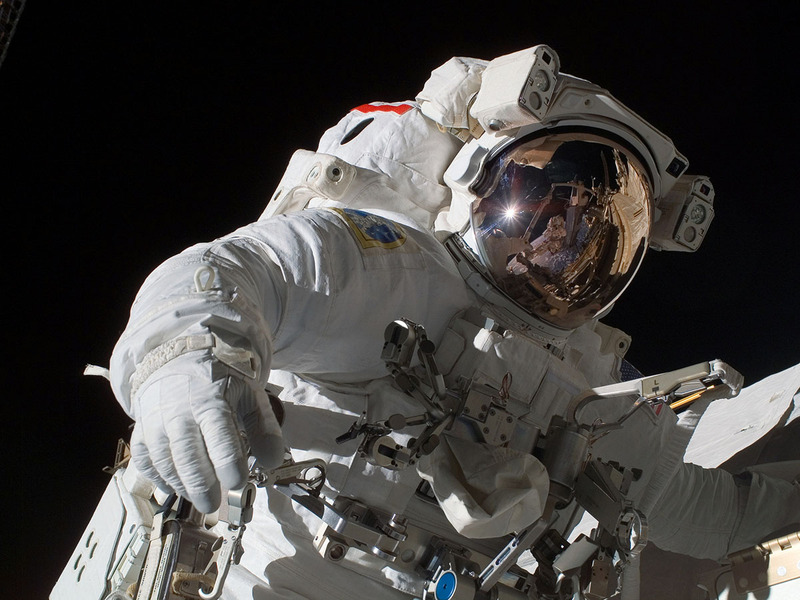 An EVA is very physically demanding and mentally challenging because you are out there for about 6.5 hours and you can use as much energy doing a spacewalk as you can doing a marathon. Sometimes I did three of these in a week. The most important thing to do on spacewalk is to take a picture. Even more important is that your buddy takes a picture of you. How you don’t do Spacewalks is like how you see in the film ‘Gravity.’ I watched that film the night before I did a spacewalk, I watched it to learn how not to do a spacewalk. Whats the worst part of spaceflight? Sometimes gravity is your friend, and we actually did a live show here in the UK. We deal with a lot of stress launching off the planet, doing a spacewalk but the most stressful was thing I ever did was trying to describe how to use the toilet in space to a live TV audience during Channel 4 Live from Space. I had to be really careful with my words. One of the things we got to do up there was receive cargo ships on a regular basis. The ISS takes a lot of maintenance, you can’t go out and get groceries, so cargo ships like Space X, Orbital ATK Cygnus spacecraft, Progress etc come up. Sometimes it’s like a traffic jam. A Cygnus spacecraft launches on an Antares rocket, not far from where I live now. Once it achieves orbital velocity, it pulls alongside the ISS, the Shuttle and the Soyuz dock, we capture these with the robotic arm and grab them. Once docked, it normally takes 2 hours to open the hatch. We then pass through the hatch opening, there are always two people doing things, with one reading procedures and looking over your shoulders. You don’t want to have one person doing something critical because if you make a mistake someone could get hurt. They Cygnus spacecraft came up and delivered all kinds of supplies. The one thing it really does well is take away your trash. Think about never being able to empty your trash except once every three or four months and you have to store it in your house. Its going to smell bad and get smaller. The ISS got darker because we were starting to block the lights. The Cygnus spacecraft is with us for about a month. We finish emptying out, take the science experiments, water, food out etc and then pack it full of trash. We take out the spacecraft with the robotic arm and basically let it go. It slowly drifts away from us, fires a small little engine and it re-enters the Earth’s atmosphere and burns up in the Earth’s atmosphere along with all the trash. What do we do for fun? Up there for 188 days. Astronauts work their whole lives trying to get off the planet and whats the first thing you do when you get off the planet? You look back at the planet, its beautiful. I love a night pass of city lights. the aurora borealis, we get fantastic light shows up there, we would sit tin the cupola and watch these green lights in waves come up off the planet. There would be nights when we see the moon rise up through the aurora and then Venus would come shooting up behind. Everything is moving fast up there, you are moving around the Earth pretty quick. When the moon rises, it rises fast. You see some really incredible things, like over a hurricane. On one of my shuttle mission we were doing an EVA while over the eye of a hurricane on STS-118. We had to land early because a hurricane was heading towards Houston and they were thinking of evacuating the city where Mission Control was. The Earth is an amazing place, you can’t get bored of it. I’ve got ten thousand photographs of the Earth, I’m still amazed at them. It’s time to come home. The Soyuz spacecraft is pretty simple. You get back in the same Soyuz spacecraft that you came up in, release the clamps, a little spring pushes you gently away, the Soyuz turns away , breaks into 3 pieces with the crew in 1 part and you re-enter the atmosphere in a fireball. The window is a few inches from my shoulder, you can see the ablative heat shield burning off so that you can re-enter safely. Once in the thicker part of the atmosphere, parachutes start to open. You have one job when reentering on Soyuz, just keep tightening your straps, because when you strap in you are in zero G and its hard to pull yourself down tight. When you start pulling G’s you sink into your seat and your straps are loose. When these parachutes start to open up, you swing around like a shoe in a dryer. Right before you hit the ground, the Soyuz fores soft landing engines. That’s not really a good name for them, should be ‘not so hard landing engines.’ You hit hard but after 6 months in space and after being tossed around like a shoe in a dryer, I thought I’d feel something as I crashed into the Earth but felt perfect, no dizziness, no pain whatsoever. That was until the big Russian technician reached in and grabbed me, pulled me out and threw me down the slide, then I started to feel it. We did some great things with the Space Shuttle programme, one of the greatest vehicles the world has ever seen. We have the Soyuz spacecraft right now and the ISS. What’s next? NASA is doing a lot of different things, not just NASA, the ESA, but especially Europe and NASA working on the SLS to launch the Orion. The Orion spacecraft will be built o hold 4 people and basically take them to the moon. Powered by the ESA built service module, all pushed into orbit by this new vehicle, the SLS (Space Launch System). The SLS is a new vehicle similar to the Saturn 5 suing old Space Shuttle technology. 5 segment SRB as opposed to the 4 SRB that the Space Shuttle uses. It will use 4 Space Shuttle main engines as compared to 3 that the Space Shuttle uses. These will be used engines and with big external fuel tanks with hydrogen and oxygen tanks. Supposed to launch a test flight that’s has slipped back to 2019 or later. Maybe the unmanned version will launch in the next two years. After that they launch people beyond LEO. They’ve taken an Apollo capsule and made it 50% larger so they can fit 4 people in. The Orion capsule itself is only good for 21 days. Obviously if we are going to go beyond the Moon and on to Mars, there’s a lot of other things in support in vehicles that we are going to need to do. There is more than just Orion being built. 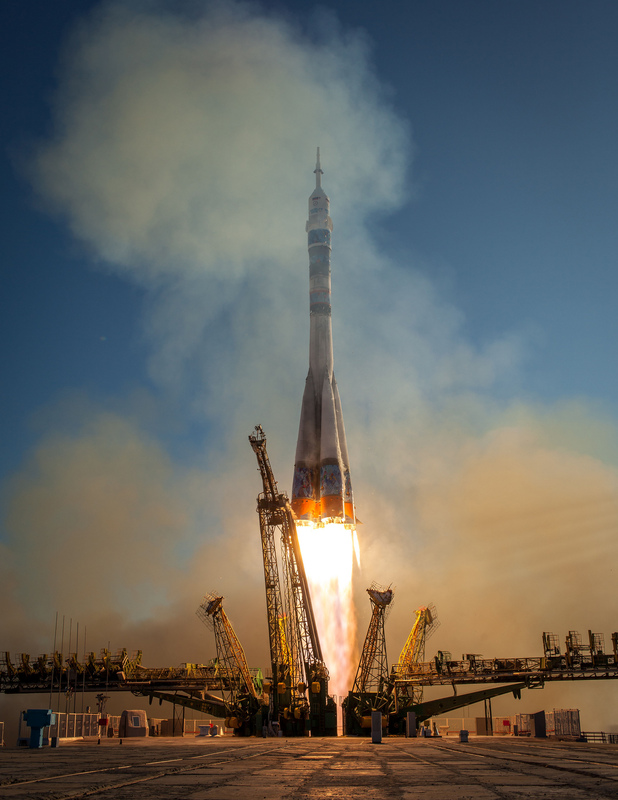 NASA has a commercial programme going on with Boeing and Space X building new vehicles that will take crew members to the ISS and no longer just have the Soyuz spacecraft to go to the ISS. We can then put a Russian on an US spacecraft and still share the resources. The plan changes depending on who the politicians are. Gorge W Bush said go to the Moon, he left the White House and we were not allowed to say Moon anymore. President Obama came in and said Mars. Now I think the plan is to go back to the Moon and my personal opinion is that’s the right decision. Mars is very far away and very difficult to land on Mars. We use the atmosphere to enter and slow us down, Mars has 1% of the atmosphere that the Earth has so we can’t utilise that to slow down. ESA is very excited at the thought of the Moon and I think we’ll have folks going around the Moon within 5 years. Obviously you did a lot of training for the EVAs, how accurately did the training for the EVAs match your experience? The way I think of training is that its like pieces of a puzzle. You train all these different pieces, you never put the whole mission together until you do the mission. 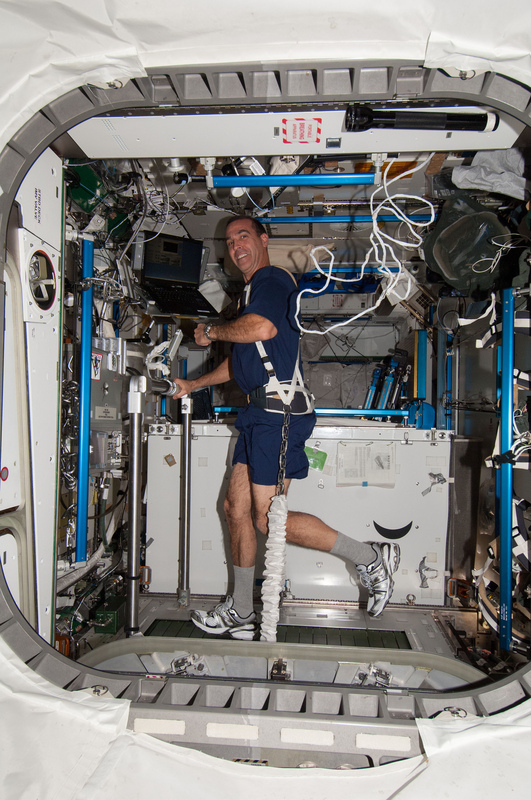 The way we train for spacewalks is several different ways. There’s the big swimming pool, the NBL (Neutral Buoyancy Lab), they put us in the water and make us neutrally buoyant, you don’t float, you don’t sink, you just stay in the water so you now have a 3 dimensional environment. That now becomes a very accurate environment because they will now sink a model of the ISS/Shuttle in the 40 foot deep, 200 foot long and 100 foot wide pool. That’s where you practice but the difference is that you have the drag of the water, if you go nice and slow you don’t feel the drag of the water, but I’m one of those guys who like to go quick, very physically demanding. Also when you flip upside down, when you are on a spacewalk, body position is everything. If you can’t reach something, you flip around. In NBL even though you are neutrally buoyant, imagine if you were upside down, all the blood is rushing to your head, all your body weight is on your shoulders. The other thing we do is VR which we are starting to do more of. Wear a small backpack called S.A.F.E.R. a little unit so that if you fall off of the ISS and you’re tumbling, the ISS cannot come and get you, you’d have a small hand controller so you could fly yourself back with very limited fuel. It all comes together on the day of your spacewalk. Even with all that training, the first time you get pout that door it’s quite a bit different. one of the things that’s really difficult to simulate is the vacuum of space where you could just go flying across. it takes a lot of orientation so that when somebody goes out that door for the first time, they get 15 minutes of adaptation practice, moving and twisting around so you body can get used to it. You said earlier about not getting in the Air Force and the Navy because of your eyesight, does NASA not have a restriction on potential astronauts with sight? They used to, NASA back in the day when I became an astronaut, NASA had a requirement for eyesight also. I was good enough for NASA but not enough for the Air Force or Navy. But now, young people like you can get all kinds of surgery, and NASA and the military accept that you can get your eyes fixed. The bad news is that they have a bout a thousand other tests you have to pass. I’ve seen people disqualified for colour blindness, depth perception, look at a thousand different parameters on your blood, you can be a very healthy person but if one little parameter is out of whack then you are out. Very tough to get in. You were lucky enough to fly on Atlantis, Discovery and Endeavour, were there any subtle differences between the three and do you have a favourite? They do have some subtle differences but to the untrained eye it’s almost imperceptible. There’s a few panels and switches that are different. Some of the Shuttles are upgraded differently, one might have GPS, the other might not. I loved them all, as I keep saying I think the Space Shuttle is an incredible vehicle but I have to have a little favouritism for Atlantis as it was my first mission. I have fond memories of first time in orbit, doing crazy astronaut tricks inside it. I’ve seen Endeavour in a museum, I’ve seen Discovery in a museum, I’m yet to see Atlantis, saving the best till last. When you are weightless, is it similar to when you are on a fairground ride? You go over a bump and feel that nauseous feeling and has anyone ever been sick and who cleans it up? No one has ever been sick in space! You make it, you clean it! Yes it does feel like that, imagine if you will that you go over that top and that moment where your stomach goes to your mouth, that’s a quick sensation of zero G, probably a little negative zero G, that’s the feeling you have. Imagine you’re in the Space Shuttle with 3G pushing down on you, several hundred pounds of force pushing down on you, you can’t simulate that so you’re feeling that for the first time. My first mission on launching and all of a sudden, I’m looking real intense at all of these displays and all of a sudden all I can think about is breathing. How come? It’s because I had 3Gs pushing down on my chest and you’ve got to remember to breathe. Then instantly in 1/2 second you go from 3G to zero G and it is weird because now you feel like you are tumbling. Your neural vestibular system is telling your brain all these lies, you feel like you’re falling, a weird sensation till your brain re-calibrates. 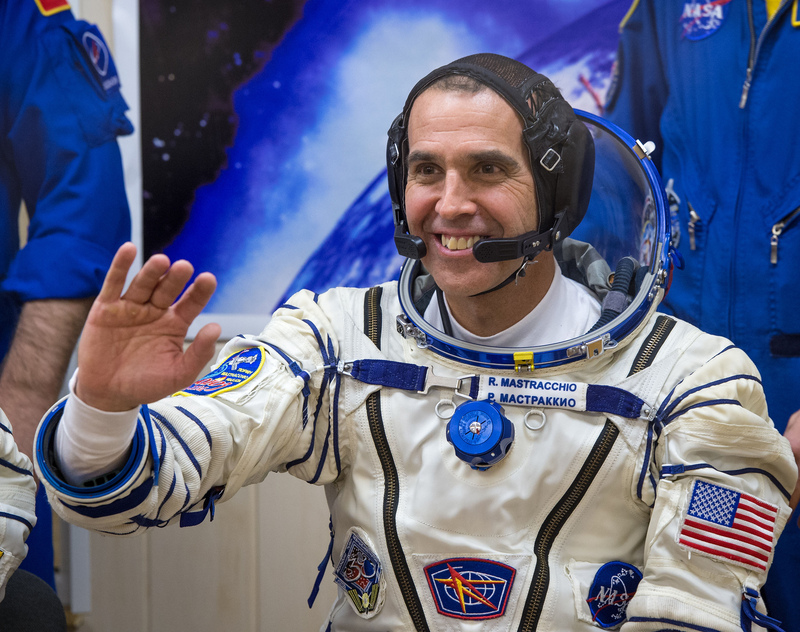 Some astronauts are very badly affected with one or two people who are really down for about 2 or 3 days with stomach awareness and other issues. I was fairly lucky, a little bit of stomach awareness but the next morning I wake up and feel perfect. I would avoid doing crazy astronaut tricks on day 1. What was the biggest challenge when you were up there? It depends on which mission. Every mission is different, we practice every mission in great detail. The biggest challenge on my Shuttle missions were my spacewalks, trying to squeeze in 3 or 4 spacewalks in a period of 8 days. You’re up there moving the suits around, collecting hardware, prepping all the things for the spacewalk and then you go out and do the spacewalk. You come back in and instantly start charging batteries, getting the suits cleaned up, replenishing the consumables so the day after next you can get outside and do it again. You’re reviewing procedures, robotic arms, have to be well integrated with everybody on the ground, robotic arm operators, who is going to suit you up. Just getting all those things done without making a mistake that’s going to hurt somebody, that’s the biggest challenge. The expedition when I went through the hatch on day 1 of 188, the biggest challenge was don’t think about day 188. Just take it 1 day at a time, it really didn’t bother me that I would be there for 188 days, it just seemed so far away. the mission was great and the challenge there was maintaining focus because you do get fatigued after a while so you have to be careful you don’t do something wrong etc. They keep talking about decommissioning the ISS, what will they do when that happens? There’s a couple of things going on right now. All the international partners get together and have agreed to keep the Space Station on till 2024, and they’re going to get together again and may move that to 2026, 2028, who knows what. I heard some talk of 2028. Now you’ve got the President of the US who says shut it down in 2024. Several things can happen to it. if there is somebody out there like the Russians or other International Partners want to keep it going, they might want to come to some kind of agreement where the US gets out of it and other countries can continue, that’s possible but probably unlikely. The most likely thing is de-orbit it, just like the Mir Space Station was de-orbited. We would send up some kind of vehicle like a Progress vehicle to de-orbit and bring it down into the Atlantic of Pacific ocean. That would be a terrible waster but everything that is built has a lifetime and the ISS probably already has had half its lifetime but the good news is that is has a lot of spare parts up there from before the Space Shuttle programme ended. We brought up stacks of spare parts so the ISS is very well stocked right now. That’s why they can still go up there right now and do maintenance. The problem is like if you are building a new house and you have an old house, it’s kind of hard to afford two houses and that’s what happens when you have NASA or an agency is trying to launch a new programme, the old programmes have to be shut down to use that money for other things. How much was your ticket on the Soyuz? I had a coupon for that so I got a little bit off. I don’t know the exact price but they didn’t take it out of my pay cheque thankfully. The Russians have a monopoly on the market so they were always raising the price. I think I was in a $50 million range for my seat to the ISS on board the Soyuz. That’s why the US is building capsules and anxious to get them in orbit. There’s a lot of bartering going on between the countries on the ISS. How much of a problem is space garbage? Orbital debris is a major issue. I worked the Orion programme before I left NASA for many years off and on and the number 1 risk to the loss of crew was orbital debris. When you look at the risks, all the others are little, it’s a self-induced issue, if you will, its like a protective shield we’ve built around the planet and the ISS is a problem also. 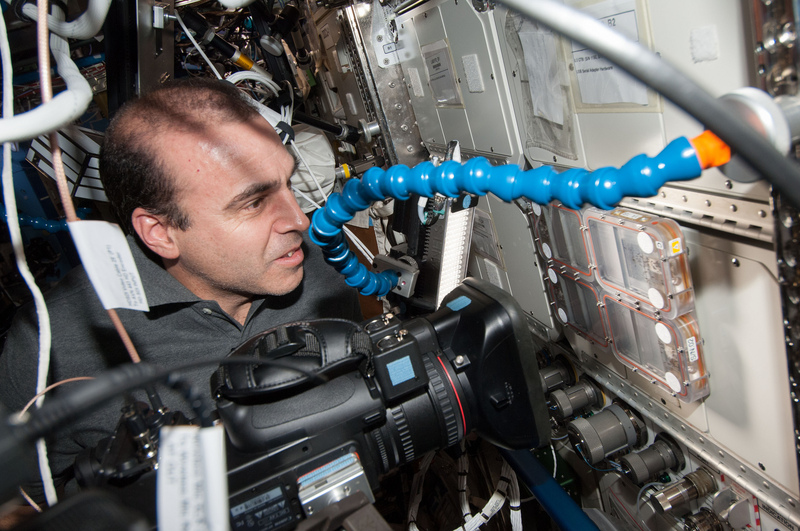 Many times I was out on spacewalks and I would see what I call bullet holes on the side of the space station. Luckily they weren’t in a pressurised module but I would see pieces of the truss where there was something like the size of the pinky of your finger where the metal was all flayed out. That’s where I cut my glove on STS-118 when out on a spacewalk. I probably slipped or grabbed a piece of material or metal that was cut open by orbital debris. I came back on a Space Shuttle mission and we had a hole in our radiator panel. These are used to cool the Space Shuttle down and they are full of tubes but the orbital debris was right between the tubes. If it had it one of the tubes, we’d have lost a lot of our cooling system and would have had to do an emergency deorbit, so we were a fraction of an inch from having to abort the mission. It doesn’t take a big piece of orbital debris, the big pieces we know where they are, the little pieces we can protect for but the bits between the big and the little that are big enough to hurt you are too small to follow and track. And when the Chinese blew up their satellite, that doubled the issue and made much worse. 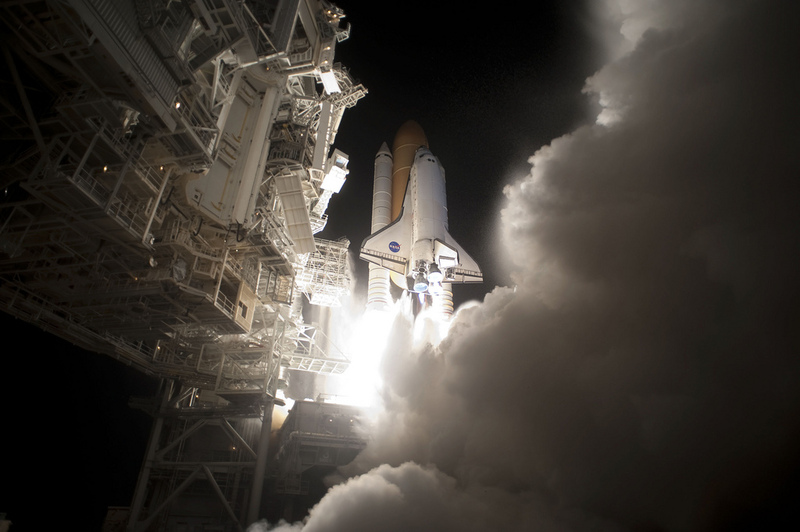 Most of the Space Shuttle launches seem to happen on a Thursday, is there a particular reason why? Yes, we launch on a Thursday because we don’t want to work the weekend, we’re lazy. A Space Shuttle launch countdown starts about 4 days before launch. We start the countdown on a Monday morning, shoot for launch on Thursday and go home on Friday! But how many times did that work out? Probably 50% at best! When you landed in the Shuttle and you had the potential damage on the heat shield, did you pop outside and have a look? Yes we all did, looked up at it, it was perfect and pristine, there wasn’t much charring around it, no burning. The folks on the ground did a fantastic job. As you can imagine, my wife, all our spouses were, we’re up in orbit doing our job, we may have a hole in our vehicle but the ground is taking care of it. We were not worried, we were just doing our job, we still had a full job to do. Meanwhile our spouses down on the planet, on the news every night about a damaged Shuttle, we don’t see any of that, but we don’t know that our spouses down on the planet are probably sick to their stomach listening to all this stuff. John Shannon was the Space Shuttle Programme Director, he just did such a great job talking to the families. We analysed it, we tested it, we were 100% confident that is was going to be safe and take care of it and they were right. Spaceflight is a team sport, you’ve got ground controllers, your crew mates on the Shuttle, you’ve got the engineers who put the vehicle together and you have to rely on your team members to do their job and you do your job, if you try to do everybody’s job then nothing works. Having gone through NASA as an engineer and a flight controller I trust them 100% to do the right thing. Somebody made a 3D model of it that was a little smaller than my fist. It want all the way through, it was just a big chunk of the tile ripped out. i think about ‘what if.’ I was the guy who would have to go out and fix it, I was the guy who 7 lives on the whole Space Shuttle programme, the whole Space Station was going to depend on, that would have been on my mind. I would have been less worried about me dying and more worried about letting the team down. What was your favourite experiment that you did in Space? My favourite experiment. One of them was playing withe the little satellites, but the one that was fun was the same Cygnus spacecraft that came up delivered some ants. Basically a little container where you could see them and they would all path in one little area, we’d put a HD camera in front of them and open up a little container where they went to this bigger area where the ants could walk around go looking for food. It was an experiment and it was educational. All the schools were watching to see how the ants reacted in zero G. We kept opening up more and more chambers for the ants to walk around. Scientists were also viewing this trying to analyse how ants go out and forage. You know how if you drop a piece of sugar, eventually an ant find it and you think heck, how did the ant find that? The way it was explained to me was that they were coming up with a process to figure this out. Imagine if someone goes off in the wood and you programme a bunch of drones and just let these drones go, eventually they’re going to find this person lost in the woods. Educational and scientific watching ants walk around in space. Have you had a particularly terrifying or scary experience apart from the whole of normal spaceflight? Usually my fellow crew members would scare me a little bit. I get that question a lot and it’s a hard one to answer because I don’t really get scared, you tend to worry about things, you know, I’ve got a spacewalk tomorrow, that can be hard to sleep and you’re anxious about doing it because there’s a lot of work to do. Again it comes down to preparation and what you’re comfortable with and we prepared in training so much. In Space Shuttle mission we trained for a year and you practice in the NBL, we used to practice a 5:1 or 7:1 ratio so in other words for every spacewalk we did, we’d do it 5 times in the swimming pool. Every ascent, we would practice hundreds of ascents and they would give us 10 to 15 failures for an ascent and in a real mission you might get 1 if it was a really bad day. You are so over prepared, astronauts are the most highly trained people in the world. When I tore my glove, they told me to hurry up and go inside the airlock, I was like “What! I’ve got work to do, I haven’t got time for this!” I wasn’t scared, I was a little embarrassed I tore my glove, I kind of blame myself. 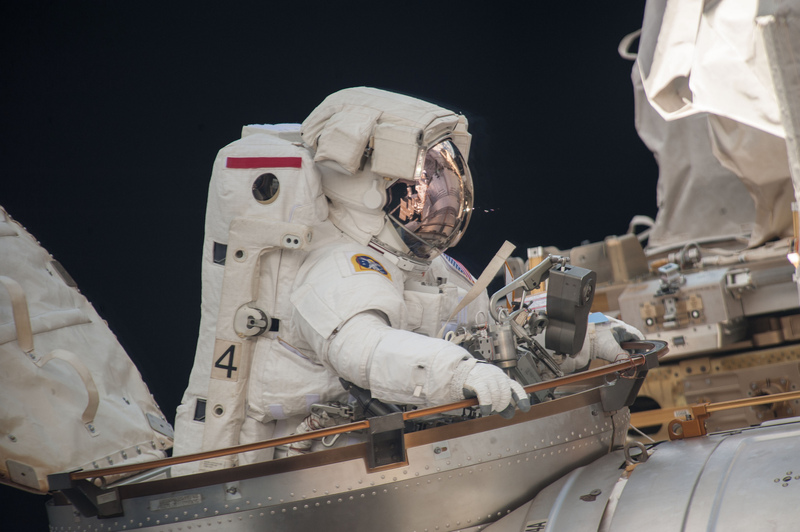 It was the third spacewalk of the mission, and I was just beating my gloves up on the first two spacewalks and on the third spacewalk I should have said that I would use my other pair of gloves but I had nice pristine gloves, I wanted to keep them pristine. They were so worn out from the other two EVAs that eventually they got ripped. I didn’t get nervous. You know you’re vehicle, you know your systems so well, you know exactly when you’re in danger and when you are not. A huge thanks to Space Lectures for another great visit and to Proffoto for a great pic. Looking forward to the next one!